Sericoderus lateralis, copyright Udo Schmidt. The Corylophidae are a group of minute beetles that usually have the head concealed beneath the prothorax. 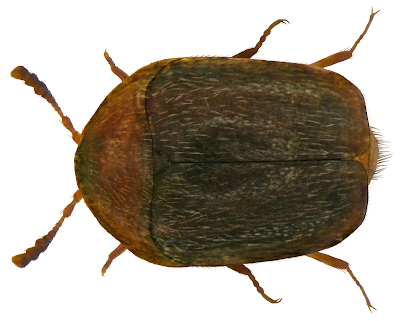 Characters (from Lawrence & Britton 1991): Minute, oblong to broadly ovate and strongly convex to somewhat flattened beetles (rarely more elongate and flattened), with small head usually concealed beneath prothorax; antenna relatively long, eight- to eleven-segmented, with large three- or five-segmented club; elytra sometimes truncate, exposing abdominal apex; fore coxae transverse or globular, trochantins concealed, fore coxal cavities externally open or closed, internally closed; mid coxal cavities moderately to widely separated, laterally open or closed; tarsi tetramerous or pseudotrimerous; abdomen with five or six sternites, none connate. Larva oblong to broadly ovate, more or less flattened, clothed with variously modified setae, with paired glandular openings on abdominal segments 1 to 7 or 1 and 8; antennae moderately to very long; head transverse to somewhat elongate; mouth-parts sometimes stylet-like and endognathous; tarsungular seta usually clavate. [B02] Bowestead, S. 2002. Sericoderus brevicornis Matthews (Coleoptera: Corylophidae) redescribed and new to New Zealand. New Zealand Entomologist 25: 65–67. [BB01] Bowestead, S., R. G. Booth, A. Silpinski & J. F. Lawrence. 2001. The genus Cleidostethus Arrow, 1929 reappraisal and transfer from Coccinellidae to Corylophidae (Coleoptera: Cucujoidea). Annales Zoologici 51 (3): 319–323.